Thank you, Lea Ann for a fabulous new favorite! On the stove top, place the bacon in a non stick skillet (or dutch oven to go from stove top to oven in one pot) over medium heat and cook until crisp. Remove the bacon, leaving the drippings in the pan, to a paper towel lined plate to drain. Turn the heat to medium-high. Generously season the roast with salt and pepper and place it into the hot pan. Sear the beef on all sides, then move to the plate with the bacon pieces. Turn the heat to medium-low and add the onion slices to the pan. Sprinkle the onions with sugar and stir to coat. Cover the pan and cook for 10 minutes, stirring once or twice. Add the garlic and cook for 1 additional minute, or until fragrant. And the flour and cook, stirring constantly, for another 2 minutes. Whisk in the beef broth, Guinness, vinegar, thyme, and bay leaf. Bring the mixture to a boil. Place the bacon pieces and beef into a covered roaster (I used my stoneware) and pour the onion mixture over the top. Place in the preheated oven and roast for 2 ½ hours. Then, use two forks to shred the beef. Stir the shredded beef into the pan gravy. Serve over buttered egg noodles. Love it! Beef + Guinness. Very appropriate for this week. Thanks for cooking for the SRC. Fabulous choice. 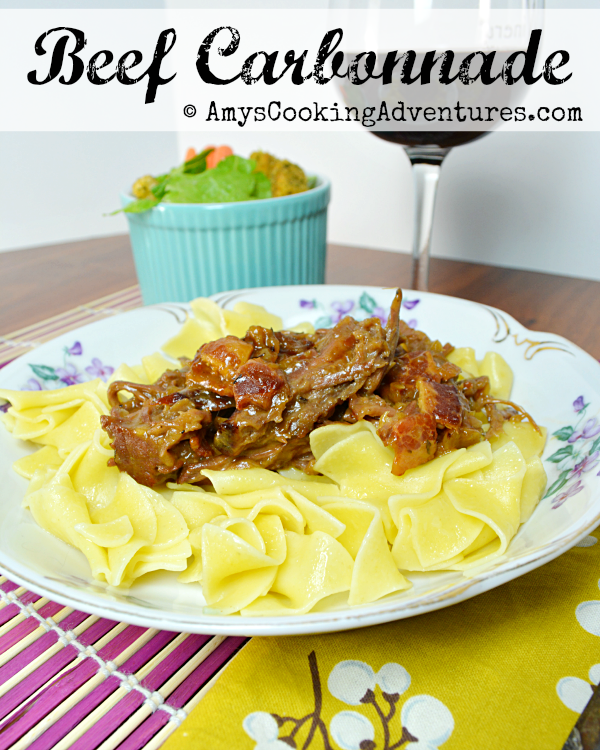 This is one of my favorite dishes on my blog and with incredible flavor. And it's a great reminder that it's been too long since I've made it. Glad everyone liked it, and what's up with that buttered noodle "thing". Too funny. 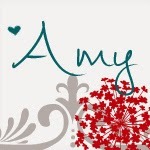 Nice to meet you through SRC Amy! This sounds fantastic! Great pick (for all your reasons!). Looks so good, great choice for the SRC. With the Guinness, looks perfect for St. Patrick's Day, too! That looks and sounds delicious! Beef + Guinness + comfort food +St. Patrick's Day = AWESOMENESS! I had your blog this month and wanted to make every single recipe of yours. Give me time... I probably will! :) Have a happy day! Yum! These flavors sound great! Oh, yummy! I cannot imagine not liking noodles....what a great recipe. Doesn't Guinness add a wonderful complexity to the flavor of the dish? This looks so good. Bookmarking this for the future. I made something similar to this a while back. So hearty and delicious!! Looks delicious! Don't worry, my kids don't like buttered noodles either...weird! Looks delicious! Don't worry, my kids don't like buttered noodles either...werid! This looks like a great recipe! I'm new to SRC and it's fun to see what everyone is making! Okay, so yum! This looks so good!